The Quinnipiac seniors celebrated senior day with a 68-51 victory over MAAC opponent Canisius, bringing their current winning streak to 12 and their conference winning streak to 43 games. Seniors Jen Fay, Paula Strautmane, Edel Thornton, Brittany Martin and Aryn McClure have racked up 99 wins in their Quinnipiac tenure. In their four years as a Bobcat they have also compiled a record of 64-6 in MAAC play. 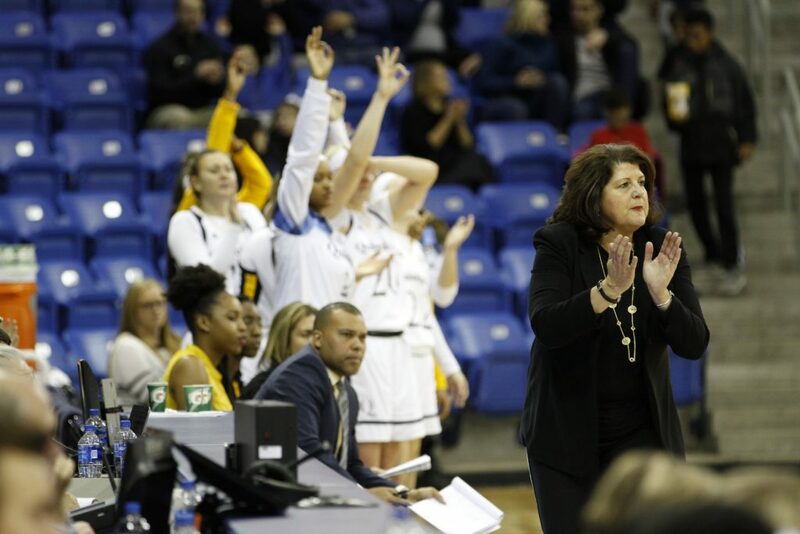 Fabbri says she isn’t getting too emotional yet, but when talking about her four seniors it was clear that the Quinnipiac women’s basketball program would not be the same without them. The MAAC has not looked like that difficult of a challenge for the Bobcats this season, nor in their last 43 conference games. Last Sunday, Quinnipiac defeated second-place Rider 72-56, and in their last game before Canisius, they defeated fourth place Niagara 62-42. Quinnipiac commanded yet another game against Canisius, holding the lead for 33:37. Canisius only had the lead for 01:48 in the game. Their last loss to a MAAC opponent was on Feb. 2, 2017. Their 43 game conference winning streak is the second longest in the nation behind the UConn Huskies. Their current 12-game winning streak is the fifth longest in the country this season. However, Coach Fabbri says there is no pressure against them to keep the streaks going. Jen Fay, who has been out since Jan. 25, was on the court for warmups but she did not check into the game until there was 4:04 left in the fourth quarter. She played a total of 58 seconds and air-balled her one shot attempt. With Quinnipiac up 58-40 at that point in the game, Fay and her teammates smiled after the attempt and crowed rewarded her with a standing ovation. Fay still leads the Bobcats in points (11.3), rebounds (6.4) and assists (3.2) per game. With Fay’s absence, everyone on the team is asked to step up and no Bobcat has had a problem fulfilling that role. Aryn McClure had a team high eight rebounds, Edel Thorton had six assists and Paula Strautmane was second on the team with 14 points and led the Bobcats’ with four steals. This game was not all about the seniors, as junior Paige Warfel led the team and had a season high 18 points. Fabbri says with everyone able to step up, it speaks to the Bobcats’ culture and how the seniors have set the tone for all the underclassmen.